Many a Casserole Lady has cared for me. The Casserole Lady brings food to the hurting, nourishment to the weary, comfort to the downcast. She’s first on your doorstep with home-baked bread and brownies, with meatloaf and soup, and of course, with casseroles galore. She ensures you don’t need to plan and prepare meals when you’re grieving a loss, are freshly postpartum, or find yourself in any other time of need. I love the Casserole Ladies, but I am not one of them. But I think my accounting system is off when I calculate this way. Maybe I shouldn’t be tallying things up like this. It shouldn’t be about me, me, me. It shouldn’t be about how valuable or useful my gifts are. We shouldn’t have a “usefulness hierarchy” — that’s a joy-stealer if ever I heard one. Instead, I’ve come to believe that it’s about the love behind my actions. It’s about my offering of love to the Lord’s Beloved, for I speak a language of love to the Church that is no less than those gifted in hospitality. That approach just doesn’t satisfy me anymore. I want to reframe the gifts discussion, and I want to reframe the love language discussion. I want to stop talking about the gifts we receive from God and start talking about the love we offer back to Him. I want to move beyond just determining how I prefer to receive love, and start embracing the way I most wholeheartedly give love. Obviously this is not an exhaustive treatise on all the ways members of the Body might speak these five different love languages! I just want to ask this question today: How do you speak love, out of an overflow of your own heart, to the Church? Not what you think you should be doing to serve. Not what you see someone else doing. Not what you’ve always done. But, how do you speak love in such a way that brings you joy? For me, the way I most wholeheartedly give love to the Body of Christ is through Words of Affirmation. I use words with the hope of blessing people, not for my sake, but for theirs. I offer words, and not just in blog posts — though they’re here too. I also pour all my love into emails and private messages, just because I want to, and because it brings me joy. It is through words that I give gladly and love fully. I take my counsel from Peter, who says “Do you have the gift of speaking? Then speak as though God himself were speaking through you,” and from Paul, who says, “If your gift is to encourage others, be encouraging.” I hear their commission to speak and encourage not through the lens of gift or skill or talent, but through the lens of love. I want the discussion of love languages to be about what we give, for the pure joy of it, and not what we need from others. I want to approach service from the vantage point of love, and not of giftings. Not from a focus on me and what God has given me, but from a focus on offering my love to others. Not in order to pigeonhole myself into speaking only one “language,” but to embrace the way I show love and to give my whole soul to it. I want our love languages to be an outpouring of love, a breaking open of our alabaster boxes. What is your offering of love to the Church? What Language do you speak to her? Check out Julie Meyer’s song Alabaster Box, in which she talks about pouring out all her love for Jesus. “When I first saw Rembrandt’s painting, I was not as familiar with the home of God within me as I am now. Nevertheless, my intense response to the father’s embrace of his son told me that I was desperately searching for that inner place where I too could be held as safely as the young man in the painting. . . . I have a new vocation now. It is the vocation to speak and write from that place back into the many places of my own and other people’s restless lives. I have to kneel before the Father, put my ear against his chest and listen, without interruption, to the heartbeat of God. Then, and only then, can I say carefully and very gently what I hear. I’m so with you. I’ve felt like Words are so not practical, not the real spiritual gift. But words are what I got and what I love to do. And I’ve found that when I finally got over myself and my fear that words are not enough, that’s when Jesus really picked them up. Thanks for this refreshing way of looking at love languages. 🙂 I would say that I love through “Acts of Service.” I would be the one bringing food to your door, but just never casseroles, because I don’t really like those! At times, I’ve compared that to others and found it lacking or unimportant in the grand scheme of things. Others are winning lives, saving souls, and things that can seem so much more important. But eventually realized that we all have different roles to play, and I’m quite happy in a supporting roll. It brings me joy to help others do what they do, or just cheer them up a little bit. I loved this, Elizabeth. 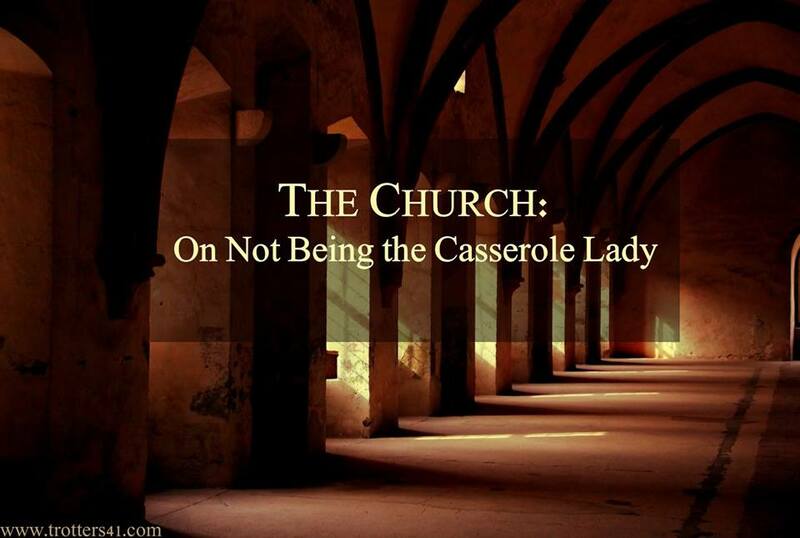 I also am a casserole lady….though not casseroles (blech). Tonight I am making pizza for 18 people and it’s no big deal. But it’s ironic because I often berate myself for not being the creative lady or the personable lady or whatever. I never even thought about the fact that maybe other people WISH they were the casserole lady….because I thought the casserole lady was no big deal. Thank you for such a great perspective. Yes it is a big deal!! Your love and service is a big deal! I could never do what you do. I’m so glad some people can! I so hope this idea can free you up to enjoy your gifts and your love language more. As Paul says in Ephesians 4:16, “He makes the whole body fit together perfectly. As each part does its own special work, it helps the other parts grow, so that the whole body is healthy and growing and full of love.” May each of us do our own special work, so that the whole Body is healthy and growing and full of love. I hope your day is blessed Amy!